Trying to Project Growth in your ARM business? Look no Further than Client Satisfaction. Retaining and growing clients is an important initiative for many of our ARM customers, and we get asked often for insight into ways to better serve and differentiate with clients. As data consultants, we primarily recommend using your data to set you apart and provide additional value. But there’s more than just your standard performance data and account services to consider, there’s customer satisfaction. And when it comes to measuring satisfaction, did you know there is one metric that can predict your company’s growth and help guide your strategic planning? It’s called Net Promoter Score (NPS). It is calculated from your customers response to the question: How likely is it that you would recommend (organization or service) to a friend or business colleague? Responses to the question range from a rating between 0 (not at all likely) and 10 (extremely likely). Based off of the score they give you, they are classified with one of three different titles. Customers that respond with a score of 9 or 10. They are loyal customers who are advocates for your company. They are likely to recommend your business to their colleagues. Customers that respond with a score of 7 or 8. They are happy with the product or service, but not to the point where they would be classified as a promoter. Customers that respond with a score of 0 to 6. They are unhappy customers who possibly could discourage their colleagues from working with your company. Once you have the results, subtract the percentage of Detractors from the percentage of Promoters. 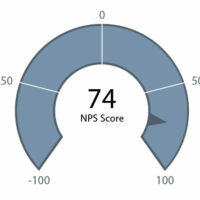 In addition to your numeric score, NPS gives respondents an opportunity to explain their answers – providing valuable insight into your customer needs. How can an ARM company apply NPS to strategic planning? Look, we are not suggesting the goal of your business is to achieve a high NPS. It’s not as simple as working on a great score and sitting back to watch the revenue roll-in. What we are suggesting is that seeking input from your customers and maintaining a metric on your performance dashboard related to customer satisfaction is good business practice. By giving it executive level focus, NPS helps to tell you where you can focus, improve, and ultimately better serve your customers. The result is loyal clients who stay longer, buy more, and refer you more business. If you have a solid NPS (and there are many benchmarks to determine this but in the financial sector it would be anything above 35), you should promote it when talking with potential customers. It’s a commonly understood metric and it tells an important story: we listen to our customers, and they are generally happy to do business with us. At The Intelitech Group, we are extremely proud of our current NPS on the KPI dashboard for our business. As of last week, we are at 74. Even with a score worth celebrating, we also still believe there is room to improve and to get more of our customers to become loyal fans of The Intelitech Group and the work we do. How will customers receive the survey? How often will we survey each customer? What will we do with the feedback? How will we communicate our customer satisfaction improvement programs? Its both a simple and strategic way to measure your customer satisfaction in a way that drives growth. To learn more about The Intelitech Group and what we do, click here.